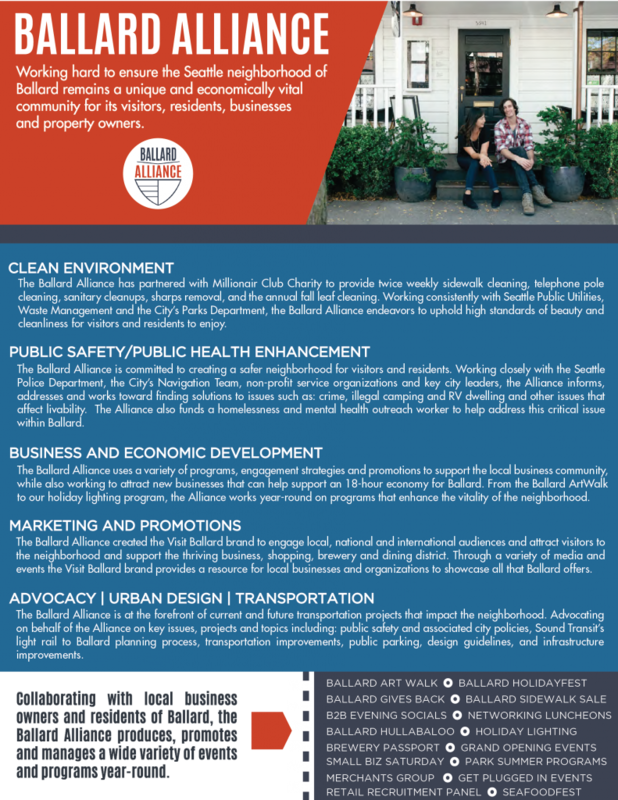 The Ballard Improvement Area is a local assessment district that funds programs and activities that directly support ratepayers as well as activities that benefit the businesses and residents within district. After an extensive strategic planning effort, led by more than 60 community leaders throughout Ballard the Ballard Chamber of Commerce began working with key stakeholders to create a long-term, sustainably-funded leadership organization representing Ballard’s businesses, residents and property owners. Following the strategic plan, work began to create a business improvement area for Ballard as the primary funding mechanism for the organization. Following a significant demonstration of support from commercial and residential property owners, the City of Seattle approved the creation of the Ballard Improvement Area (BIA) in the fall of 2016. The BIA became effective on January 1, 2017 and is a seven-year program funded through assessments on commercial and residential properties in the Ballard core. 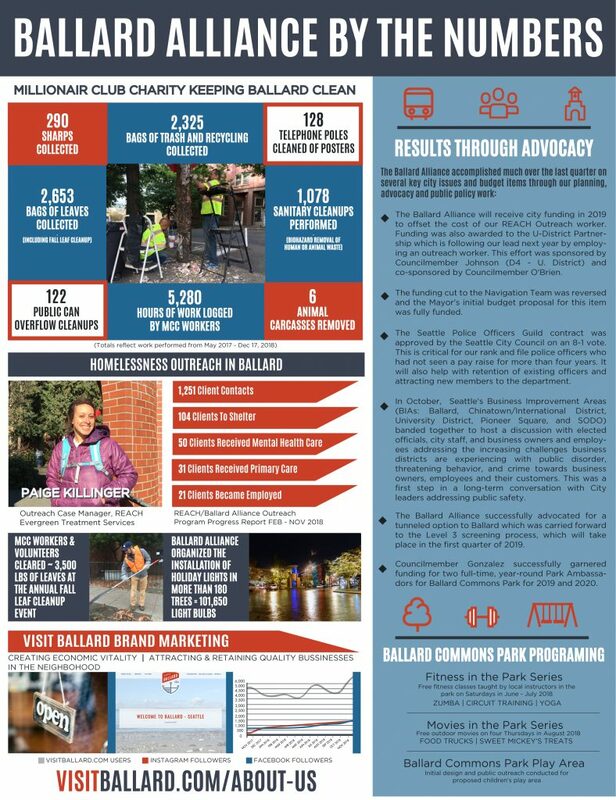 Effective January 1st, 2017, the Ballard Chamber of Commerce became the Ballard Alliance in name. This is an important transition because the new organization now represents business and residential interests. 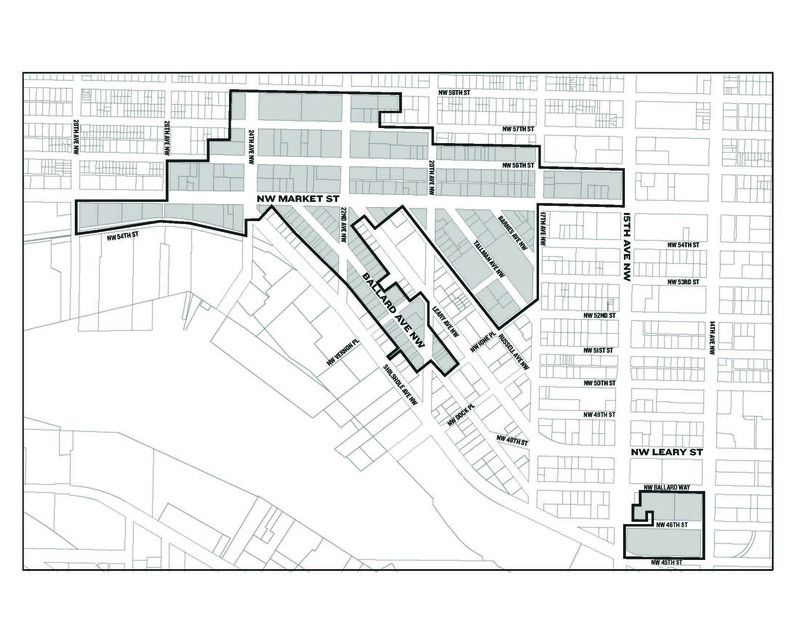 The Ballard Improvement Area is administered by the City with oversight by the Ratepayer Advisory Board (RAB) comprised of ratepayers within the boundary. The RAB serves in an advisory capacity to the City in administering the Ballard BIA. The City has contracted with the Ballard Chamber of Commerce dba Ballard Alliance to administer the Ballard BIA and manage its day-to-day operations in accordance with City policies and the annual work plan and budget approved by the Board. The Ballard Alliance Ratepayer Advisory Board (RAB) is comprised of ratepayers and ratepayer representatives that serve in an advisory capacity the City of Seattle in administration of the Ballard Improvement Area (BIA). The RAB is representative of the entire geographic area of the BIA; representative of all ratepayer classifications and sizes; and consists of both residential representatives and commercial tenants. No less than one-third of Board Members represent commercial ratepayers and no less than one-third of Board Members represent multi-family residential ratepayers.